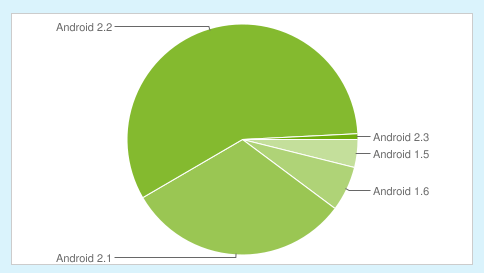 Google maintain a running tally of which Android gadgets are running which version of Android. As of 2 February, over 57% reported using v2.2, with v2.1 coming in second at 31%. It's based on tracking Android devices that visit the Android Market. Not all Android gadgets can access the Marketplace, so this chart doesn't actually reflect the real world market shares of the various versions of Android. I can't tell you how many Android devices aren't being counted, but given the growth of tablets I'd say it's at least a third and possibly as much as half. But I don't really know because answering this question is like asking how many birds did I not see today. That which isn't measured cannot be counted. Thanks. I didn’t know if it was obvious or not. It is surely a good catch and I don’t think it’s pretty obvious to everyone. One small correction though… 2.2 is Froyo. Gingerbread (2.3) isn’t officially out on any device (thus the 0.8%).